In December 1982, Mercedes-Benz introduced the all-new 190 model, aiming at a share of the market that was previously not covered. 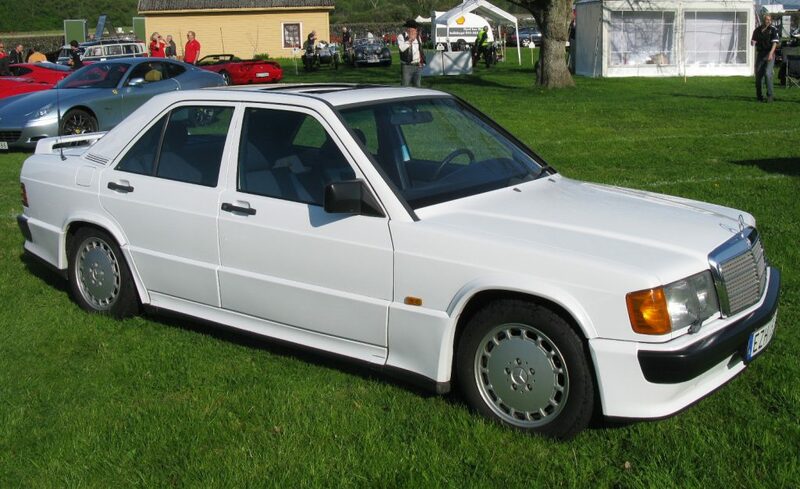 It may be difficult to imagine in a time where the A-class is one of the examples of a huge and very varied range, but the “Baby-Benz” led to a small outcry among people who saw it as a dilution of the Mercedes car range. The 190 moniker was derived from the 1.9l displacement of the base engine. The design by Bruno Sacco was all new, much more modern both than previous Mercedes offerings and than the competitor BMW E30 3-series. Many of the design elements would also make their way into the W 124, the mid-range model than would eventually become the first E-class. Initial engine offerings were the carburetted 90 hp 190 and the fuel-injected 122 hp 190E. A diesel model soon followed. Throughout the long production run, several new engines were introduced, such as a 136 hp 2.3l, and the six-cylinder 2.6 with around 166 hp. The 1.9l engine was eventually replaced by a 2.0l, with a new 1.8l engine being added as entry-level engine. More famous and interesting are of course the various sixteen-valve engines that were built for homologation purposes: the 2.3-16 and 2.5-16, which gained fame in the DTM race cars – especially the 2.5-16 Evolution II with its gigantic rear wing, used to battle the BMW M3 and Audi V8 in what maybe were the best years of the DTM. Power ranged from 170 hp for the 2.3-16 with catalytic converter to the 235 hp Evo II. The 190 was only ever offered in a single body style. The successor W202, the first model to be called the C-class, was introduced in 1993. I have on several occasions driven the successor model (W 202) with the 1.8l engine (C180) and automatic transmission, which was the most anemic car I have ever driven. I would stay away from the base engines (and of course the Diesels) if you are looking for a bit of performance. The 2.6 does 0-100 in 9.2s with a top speed in excess of 200 kph. The 2.3-16 is of course a bit quicker, but keep in mind that the catalytic converter model only has 170 hp. Iconic design. Readily available (at least the standard models). Good parts availability. Lacks amenities such as airconditioning that would be considered in a daily driver, while being a bit too modern to be considered an oldtimer. Less sporty image than a BMW (no two-door variant!). Prices for the 16-valve models have gone up considerably. The 2.6, which is still available for reasonable prices. The sixteen-valve models have reached prices that are matched by younger, much more powerful cars.